According to the World Health Organization, around 10,000 diseases in the world are monogenetic. Caused by modification or mutation in a single gene present in every single cell of a body, these diseases can only be prevented and diagnosed by a method called genetic testing. Thalassemia, one of the most prevalent genetic disorders in the world is considered a major public health concern. In Iran, around 8000 pregnancies every year are at risk of thalassemia. Statistics like these show the imperativeness of genetic testing which is useful in highlighting the vulnerabilities of diseases that are inherited genetically. 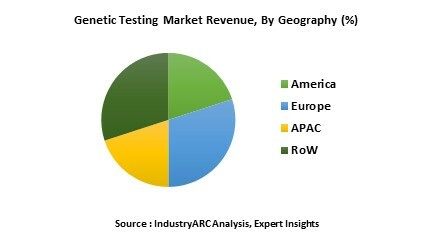 Genetic testing market has a wide end-user industry, prominent ones being forensic and hospitals. In forensic testing, the process is used for legal purposes in order to solve cases with vague information available. With constantly rising population, genetic diagnosis is extremely essential in today’s world. The genetic testing market size in 2018 was estimated to be between $7,300-8,300 million. The market demand will experience a promising growth in the upcoming years with an estimated compound annual growth rate (CAGR) between 12.5%-13.5% during the forecast period of 2019-2025. Genetic testing is simply a process in which our DNA which is present in the cells and runs through the bloodlines of all living beings is extracted and put under thorough examination. Through this, changes in the structure of chromosomes are identified and it is easier to predict the kind of disease a person has contracted. Genetic testing is also useful in identifying the level of susceptibility that a person has towards disease in order to prevent it from materializing. North America with its eminent genetic testing centers including the ones in Massachusetts Institute of Technology and Harvard University leads the genetic testing market geographically. In 2018, the regional market share of North America was 45%-47% which is nearly half the size of the global market. According to MIT Technology Review, the number of people who got their DNA analyzed in 2017 nearly doubled as compared to previous years and exceeds 12 million in the current year. According to World Health Organization, 9.6 million deaths occurred worldwide due to cancer in the year 2018. These statistics are alarming as this disease is on an all-time high affecting the entire world, and is a borderline epidemic. Thanks to genetic testing, timely diagnosis for breast cancer, ovarian cancer, bowel cancer, womb cancer, and prostate cancer is readily available. History of cancer in the family is a prerequisite for genetic testing and help in the prevention of this fatal disease. This application segment was one of the most prominent in the genetic testing market and is expected to grow steadily in the forecast period of 2019-2025. Unlike the early 20th century, key market players of the genetic testing market do not have to struggle with convincing consumers about the benefits of DNA testing. According to MIT Technology Review, in 2016 Ancestry.com spent a whopping $109 million on television advertisements in the United States of America. Right below this, 23andMe.com spent $21 million on advertisements which helped them gain a lot of popularity. Direct advertising does the trick and provides impetus to the market. A major challenge faced by the genetics market is the lack of medical solutions for all the diseases diagnosed. While it is easy to predict which diseases a person is suffering or might suffer from, the proper prognosis is a challenge. Funded research in prognosis after disease detection is a much-needed way to combat this market challenge. Some of the key market players of the genetic testing market are Genentech Inc., Sorenson Genomics, LLC, Abbott Molecular, Bayer Diagnostics, Biocartis, BioHelix, Celera Genomics, Genomic Health, HTG Molecular Diagnostics, and PacBio. Genentech Inc, one of the leading companies working in the field of genetics have been consistently working on personalized medicines. According to them, diagnosis through genetic testing is only the first step in the road to eradicating cancer. The process can also be used to develop personalized medicines. There are several ways of getting genetic testing done, one of which includes contacting your doctor who will get the test done for you. However, technological advancement has provided the general public with liberty to conduct their own genetic testing. Websites like Ancestry.com and 23andme.com provide DNA testing kits which are delivered to one’s doorstep for as little as $90. After receiving the test results, one can easily upload them on third-party interpretation websites which print out medical diagnosis and provide their analysis. Ease of accessibility in genetic testing has massively disrupted the market as more and more people enroll online for genetic testing and become aware of their DNA data. 1 in every 25 American adults are aware of their genetic data and are relying on the genetics market for improvement in their health. The base year of the study is 2018, with forecast done up to 2025. The study presents a thorough analysis of the competitive landscape, taking into account the market shares of the leading companies. It also provides information on unit shipments. These provide the key market participants with the necessary business intelligence and help them understand the future of the genetic testing market. The assessment includes the forecast, an overview of the competitive structure, the market shares of the competitors, as well as the market trends, market demands, market drivers, market challenges, and product analysis. The market drivers and restraints have been assessed to fathom their impact over the forecast period. This report further identifies the key opportunities for growth while also detailing the key challenges and possible threats. The key areas of focus include the types of cheese in the genetic testing market and their specific applications in different areas. The genetic testing market can be segmented on the basis of testing, method, testing sample and industry. By type, the most prominent bifurcations are forensic testing and newborn screening. On the basis of the method, the market can be divided into molecular, chromosomal, and biochemical. Based on the testing sample, the market can be bifurcated into saliva, blood, and others. And by industry, the market is divided into laboratories, hospitals, and blood banks. 1. Is the market for the Genetic Testing growing? How long will it continue to grow and at what rate? 13. What is our Vision 2030 for Genetic Testing market?